Note: we think it right to point out that this article by the former press secretary of the head of the Chechen Republic, Ramzan Kadyrov, does not express the editors' point of view. However, we believe it is important to hear the views of all the parties concerned. We earnestly ask our readers to refrain from offensive comments and ad hominem attacks. For Chechnya the main political event of last week was undoubtedly the meeting in London between the Speaker of the Chechen Parliament and an emissary from the self-proclaimed Republic of Ichkeria, a meeting which led to an agreement on the holding of a World Chechen Congress in order to work out a unified political platform. However, in Chechnya the things that are happening just now are not seen merely as an abstract game of political patience which bears only a tenuous relation to the realities of everyday life. For a great many people they represent a key turning-point in modern Chechen history. The London meeting has every chance of becoming, if not the first, then certainly the most serious and irreversible step towards a definitive solution to the problem of Chechen separatism. But the issue of so-called Chechen “separatism” should not be confused with that of international terrorism, which has now taken root not only in the Chechen Republic, but also throughout the North Caucasus. These are two wholly different issues. The Caucasus Emirate that is allegedly being built in the North Caucasus by the criminal authority of Dokka Umarov and his foreign mentors has nothing to do with the self-proclaimed Chechen Republic of Ichkeria. The separatists are people who, carried along on the wave of revolutionary romanticism and aspirations to national sovereignty that characterized the early 1990s, embarked on the building of an independent and sovereign secular state based on a revival of national culture, science, education, and so forth. The religious extremists, on the other hand, are a handful of foreign jihadist bandits who have the blood of hundreds upon hundreds of people on their hands. The most serious crimes committed by them have no chance of being pardoned. As a result, the extremists have no choice but to take to the hills and seek refuge in rat holes. Through a tragic confluence of events, the first leaders of Ichkeria became drawn into armed confrontation. But times have changed, and changed radically. The methods that used by Umarov’s armed groups could not have been imagined by the first Ichkerians even in their worst nightmares. It is also worth bearing in mind that, contrary to the statements of some political analysts about the “zero” political influence of Akhmed Zakayev, behind him stands a small, but recognizable and very real group of people. They are susceptible to political fashion and are capable of switching their views to the opposite of what they formerly believed in. Among them there are, however, those who fled abroad, remaining faithful to their political ideals. 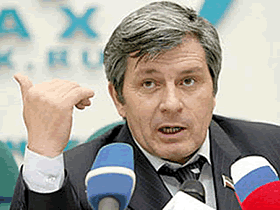 They include men like Umar Khanbiyev, general representative of the Ichkerian president abroad, Umar Sugaipov, separatist envoy to the United Kingdom, Ramzan Ampukayev, vice-president of the World Chechen Congress, who represents the interests of the Chechen government in exile, and Zakayev’s close associate, “prime minister” Yaragi Abdullayev. All of these "returnees" have undergone severe trials and tribulations, and they have deliberately given up their life in exile. And now they are back home. This is clear testimony to the credibility of the peace-making policy which Ramzan Kadyrov has adopted as he tries finally to overcome the internal Chechen confrontation. The World Congress that has been agreed on by Zakayev and Abdurakhmanov will be attended by delegates from the Chechen Republic and representatives of the Chechen diaspora communities that are scattered around the world. The dates and the agenda will be decided by the organizing committee. Together, the Chechen authorities and the so-called "Zakayev Government” will create a special joint commission which will make the preparations for the event. Ramzan Kadyrov’s chief negotiator, Parliamentary Speaker Dukvakha Abdurakhmanov, has expressed great optimism about the progress of the talks. Zakayev, in his turn, has said yet again that he recognizes the legitimacy of the new Chechen government and that he stands ready to cooperate with it. The Congress is being held in order to find and adopt solutions that will be accepted and recognized as legitimate by the whole of Chechen society. What is at stake now is the acceleration of the republic’s future socio-economic development. Obviously, if a systematic approach to this task can be found, the Chechnya of tomorrow will emerge as a region with a potential that will be the envy of many entities within the Russian state. The last and perhaps the most important point is that for several months now, President Ramzan Kadyrov has been reaching out to his political opponents. He is intransigent only towards those who to this day are shedding blood on Chechen soil. The result of these peace initiatives was the decision taken in London last week. I repeat: that meeting was an unprecedented step forward in the search for peace and mutual understanding towards which Chechen society, until recently shattered and divided, is now moving.